Gaia, Terra in Roman mythology, was, in most myths, born from Chaos and primordial mud, and she and Uranus went on to create the hills and the sea (Uranus created the sky), the Titans as well as a whole slew of monsters and giants. She also paired up with Pontus and gave birth to sea gods and with Tartarus to create Echidna, mother of all monsters. She had over fifty divine children all told, so I’m not going to list them all here, but I will get to them on other mythology Mondays. I go into the whole creation and overthrow of Uranus and Chaos here. 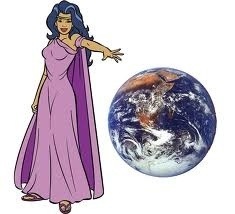 But Gaia is interesting even without all that stuff, and not just because she IS the earth (yeah, the primordials would be hard to write a book about because can you even picture it?) but because she was the original prophet. She was the power behind the oracle of Delphi before she passed her abilities on to Apollo. Oaths sworn in her name were the most binding oaths in all of Greece. Which is kind of weird considering it looks like she switched sides a lot. First she helped Cronus overthrow Uranus, then she helped Zeus overthrow Cronus, and then she helped the Giants try to overthrow the Olympians. But I like her. Because in all three cases she helped the underdogs who were being mistreated. She drops out of mythology except the occasional mention (like in the Persephone myth) after the Gigantomachy, but she doesn’t die. She isn’t imprisoned in Tartarus. She IS the earth so she’s present in every myth. Very powerful, very ancient goddess, and you do not want to get on her bad side.